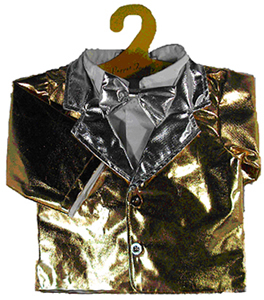 Sunshine Clothes Gold Tux is made of shiny gold tricot and finished with a shiny silver collar and lapel. The bow tie is matching silver material and the jacket buttons or unbuttons. Use it for that MC, dancer, singer, performer character and it will add pizzazz to the part. This costume fits rod arm puppets that measure from 14"-18",Â This costume comes in a plastic bag on a durable cardboard hanger, which will help with storage.